1 Preheat the oven to 180°C, gas mark 4. Line 2 x 6-hole muffin trays with paper muffin cases. Beat the butter, sugar, eggs, flour and spices in a bowl until pale and creamy. Stir in the grated carrot and sultanas and divide among the cases. Bake for 25 minutes or until risen and just firm to the touch. Transfer to a wire rack to cool. 2 For the topping, cut the carrots into 4cm lengths. Slice lengthways as thinly as possible then cut the slices into matchstick-sized pieces. Cook in boiling water for 10 minutes or until very soft. Drain well. 3 Put the caster sugar in a small, heavy-based saucepan with 3 tbsp water and heat gently until the sugar dissolves. Add the carrots and cook gently for about 12–15 minutes, stirring occasionally, until the syrup is thick and the carrots are glossily coated. 4 Beat the soft cheese, butter and icing sugar together in a bowl until evenly combined. 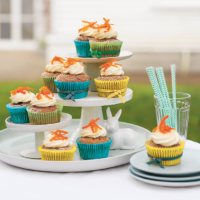 Spoon or pipe onto the cooled cupcakes and top with a spoonful of candied carrots. These are best eaten on the day they’re made. Pipe or spoon the frosting onto the cupcakes as soon as they’ve cooled, but add the candied carrot just before serving.